This week's spotlight performance is a real trip down memory lane, particularly since it's from the first year of official DCI videos. For those who weren't around in 1974, it helps to know that the first VHS (Video Home System) tapes weren't introduced to the United States until August 23, 1977, four days after the DCI World Championship Finals. An upstate New York television station taped a number of corps at the 1974 DCI World Championship Prelims in Ithaca for a local news program. One of those tapes survived, which is why we now have video recordings of the top three corps (Santa Clara Vanguard, Madison Scouts and Anaheim Kingsmen) from the 1974 Championships. Cornell University's Schoellkopf Stadium was host to the 1974 DCI World Championships, and for the second year in a row, Santa Clara Vanguard took top honors. The corps' production started with "Siegfried's Rhine Journey" by Richard Wagner from the 1876 "Die Götterd?¤mmerung (Twilight of the Gods)." It was the prelude to the sixth act of the last opera that comprised Wagner's massive four-opera "Ring of the Nibelungen (The Ring)." This piece exemplified Wagner's use of leitmotiv, short musical themes that are instantly identifiable with a specific character or event throughout an opera. Next was Benjamin Britten's "Variations and Fugue on a Theme of Purcell," better known as "Young Person's Guide to the Orchestra." The 1946 work was originally commissioned for "Instruments of the Orchestra," an educational film. This is one of the most popular works for children's concerts, sitting on the same plane as Prokofiev's "Peter and the Wolf" and Saint-Sa?«ns' "The Carnival of the Animals." Santa Clara Vanguard included five movements of the 15-section work, performed in one continuous movement. Britten titled the opening movement "Theme: Allegro maestoso e largamente." (This is loosely translated as lively, majestic, slow and broadly.) In the original, the theme starts out with all instrumental voices together, and then it features the woodwinds, the brass, the strings and finally the percussion. One of the most notable elements of this opening was the way Vanguard's marching timpani were prominently featured. Previously, marching timpanists weren't all that well known for changing pitches at ease, or even playing in tune. DCI Hall of Fame percussion arranger Fred Sanford wrote in scads of pitch changes that required each of the four timpanists to quickly rotate each kettle's tuning crank and be spot on in pitch, all the time while marching. "Variation E: Brilliante: alla polacca" (a sparking dance in ¾ meter, performed in the manner of a polonaise, a dance of Polish origin) was originally conceived for violins split among several parts. 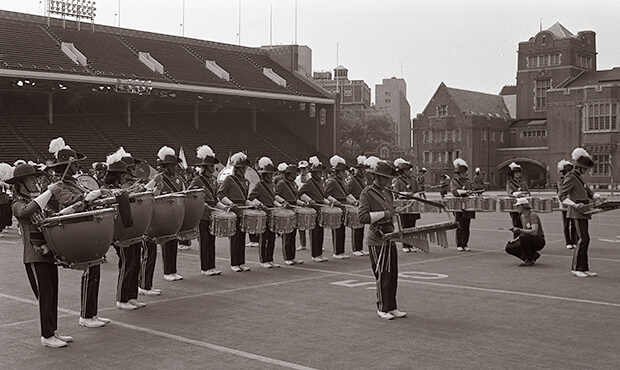 "Variation M: Moderato" (moderate pace) featured all the instruments of the drum corps percussion line, just as different percussion instruments were featured in the original. 1974 was the first year mallet keyboards were allowed in DCI competition, and then only two instruments—bells and xylophone—carried by the performers, were permitted. The snare drummers famously crossed their legs, leaned on each other and played drum-to-drum with just their right hands. "Variation L: Allegro pomposo" (brisk, grand and dignified) originally featured the trombones and tuba and was sort of a dramatic fanfare heading into the final section. "Fugue: Allegro molto" (multiple voices imitating each other, very fast) finished off the production. That climactic portion brought something to the field that was quite daring for its day. Two sections of the corps marched in different meters (time signatures) at the same time; a fast four in the sopranos laid upon a slow three in the lower voices and percussion. Even more fascinating was watching the color guard rifle section members, who started out in the fast meter (against the flags' slow meter) and then slipped into the slower meter with their feet as the piece neared its conclusion. This is arguably the moment that won over many musicians who previously held little serious regard for drum corps. It cannot be over-emphasized how huge an impact this part of the show had on the artistic development of the drum corps activity. Leonard Bernstein's "Overture from 'Candide'" served as the concert standstill piece for Vanguard's production. The comic operetta is based on the sardonic book by 18th Century satirist François-Marie Arouet, who is more widely known in history as Voltaire. The operetta was regarded as a failure when it was introduced in 1956, but the "Overture" achieved phenomenal success in both its orchestral version and the arrangement scored for winds by Clare Grundman. In the concert hall and on the drum corps field, the overture, full of tricky time signature changes throughout, flies by at blinding speed. Vanguard's closer was "Send in the Clowns" from Stephen Sondheim's, "A Little Night Music." The play inspired by Ingmar Bergman's film, "Smiles of a Summer Night," debuted on Broadway in 1973. As popular as the song is today, it was not a hit until a couple years later, when it was recorded by a diverse group of entertainers, including cabaret singer Bobby Short, pop and folk artist Judy Collins and mega-performer Frank Sinatra. The song reflects on disappointments and wrong turns taken in life. This closer musically was notable for its extensive use of three notes across two beats, something known as hemiola. It was quite rare in its day for a drum corps to play over the beat like that, and music judges did not miss that. This led into the short tag of "Bottle Dance" from the smash hit musical, "Fiddler on the Roof," by Jerry Bock and Sheldon Harnick, extracted from the wedding scene at the end of Act I. The theatrical production, which opened in 1964, became the first Broadway musical to play more than 3,000 performances, holding the record for about a decade until "Grease" came along. SCV first played selections from the musical in 1970, and again in 1971, 1972 and 1973. 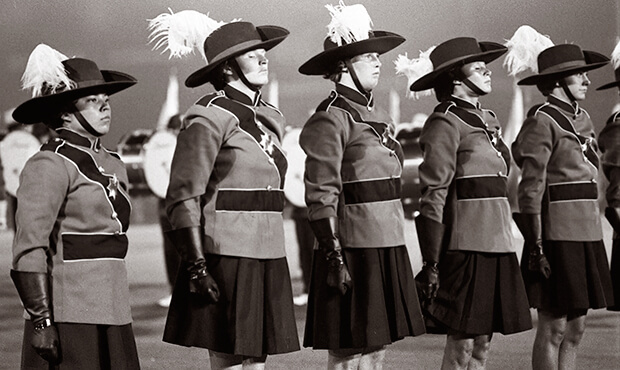 The corps' famed maneuver, also known as the "Bottle Dance," became one of the most iconic moves in all of drum corps. Ten color guard members knelt down, arms interlocked, and moved forward on their knees. This became a trademark move, first introduced by the corps in 1972 and 1973, and brought back in many subsequent years. For this week only, you can save on the Legacy Collection DVD that contains two complete Santa Clara Vanguard performances; one from the DCI Midwest Finals and one from the DCI World Championships Prelims.